“FRITZ” in Weiden at Lake Neusiedl not only offers a year-round gastronomy, but also a year-round event area. Apart from setting up a new culinary highlight, the project should strengthen the region by creating new jobs, supporting local partners and suppliers, and increasing the number of overnight stays in the Neusiedlersee region. 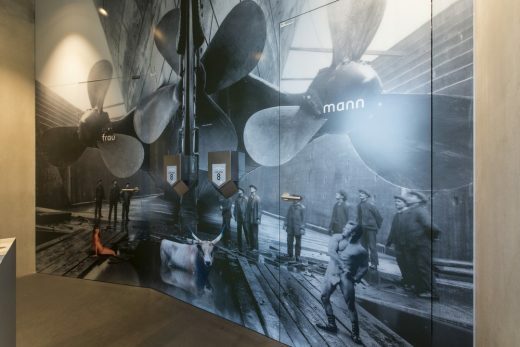 On the ground floor, the 300 sqm restaurant area can accommodate 150 guests. 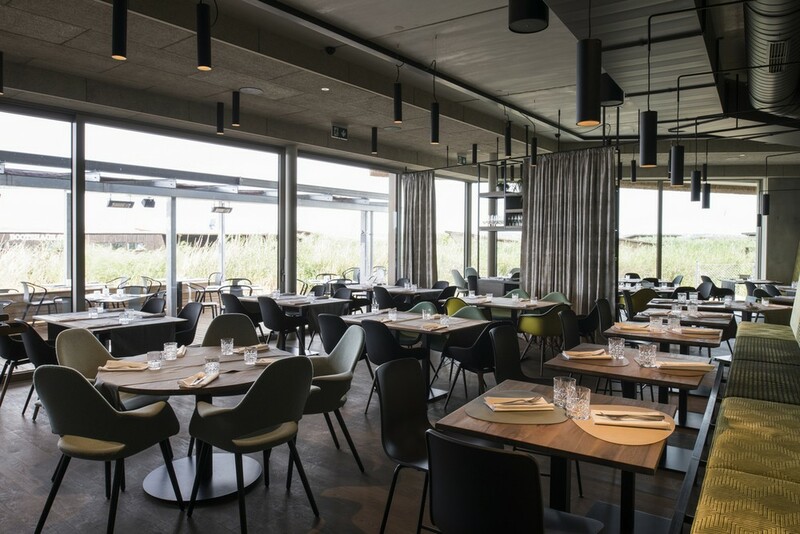 In summer there is also a 500 sqm outdoor terrace with 250 seats available. 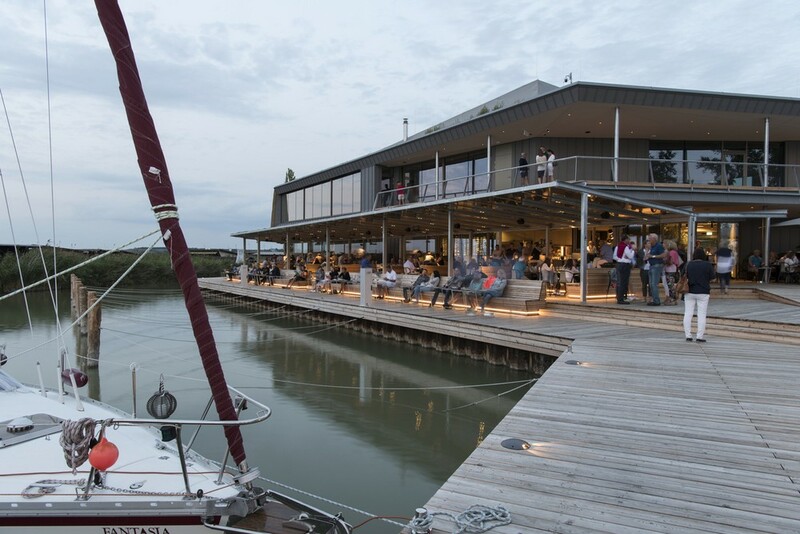 Furthermore, in the ground floor zone, there are additional ancillary premises and additional functions, such as a grocery store, a wine store and a large-scale pier system. 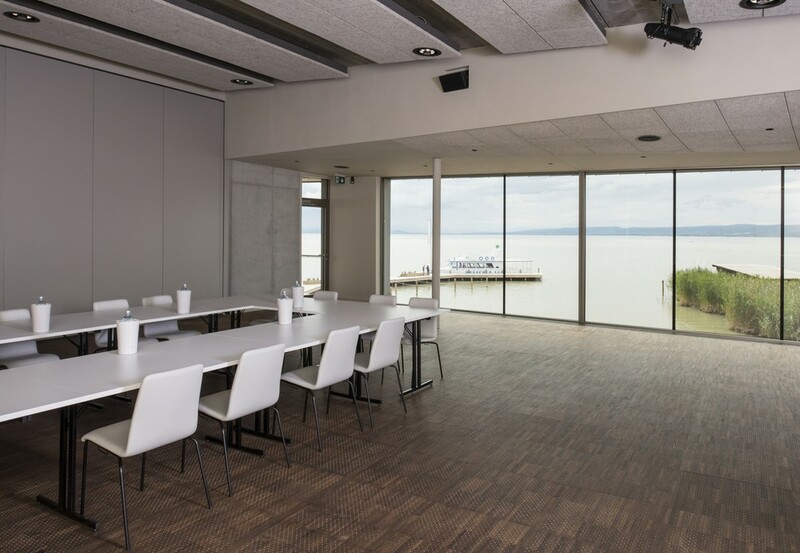 The 650 sqm large event area on the upper floor can be subdivided by mobile partitions and can therefore be used for events of different sizes and types. 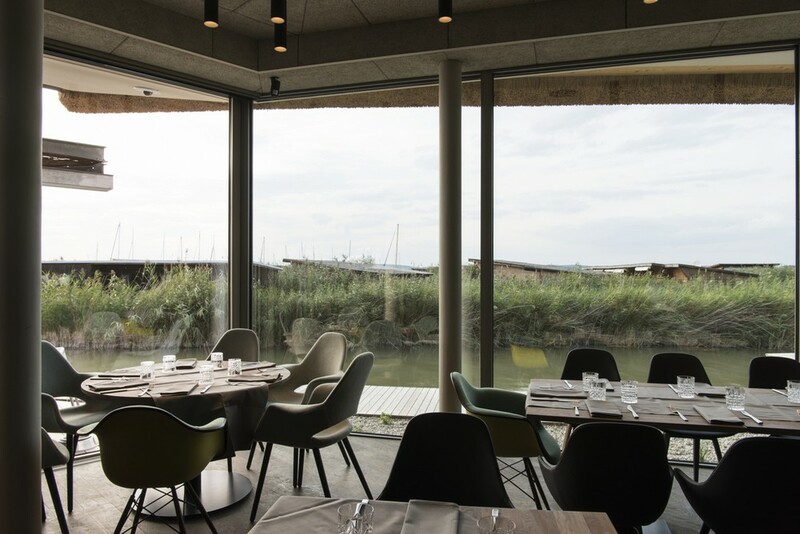 The two-storey structure blends harmoniously into the surrounding landscape and takes due to its building structure and height development consideration for the protected environment. 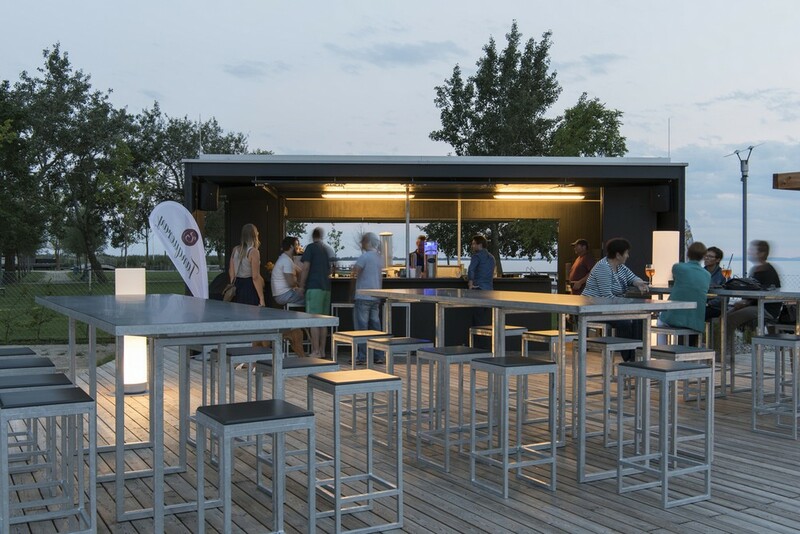 The height of the roof is dependent on the function and has a total height of 10m in the area of the event area in relation to the existing terrain level. 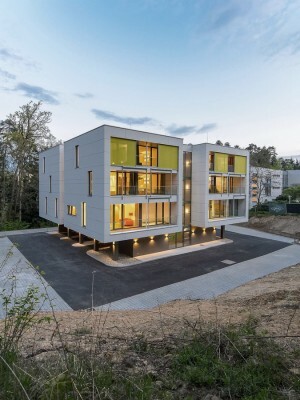 Due to the structure of the building in a main building and an area with auxiliary functions, the visible facade length is reduced and thus adapts optically well into the small-scale settlement structure. With regard to the choice of materials, the regionally prevailing materials are used in particular. A roof with extensive greenery and the reed facade make the building harmonious with the surrounding landscape. 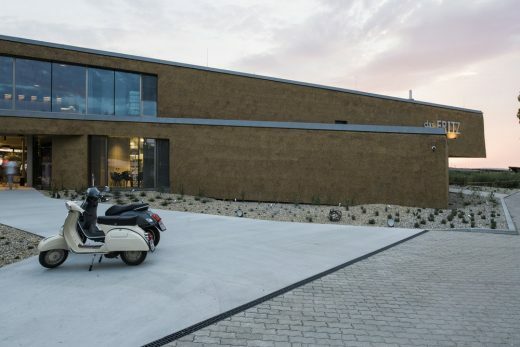 In the winter, the two functional areas, the main building and the side area, connect a foyer, which marks the entrance zone together with the vinothek and the grocery. 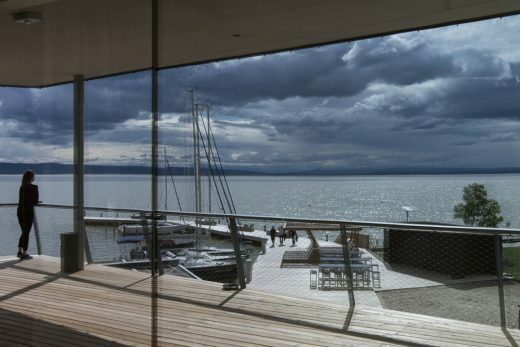 In summer, the glass wall of the foyer can be fully opened, leaving the building open and permeable. 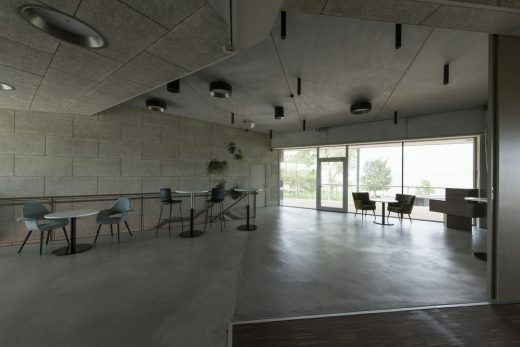 From the public access terrace on the upper floor, the visitor can see the beauty of the region and perceive the vastness of the plain. In total, 35 boat berths are available to guests in the marina. These can be used for a relaxed arrival or departure by sea and for a trip to the water and to the surrounding localities. 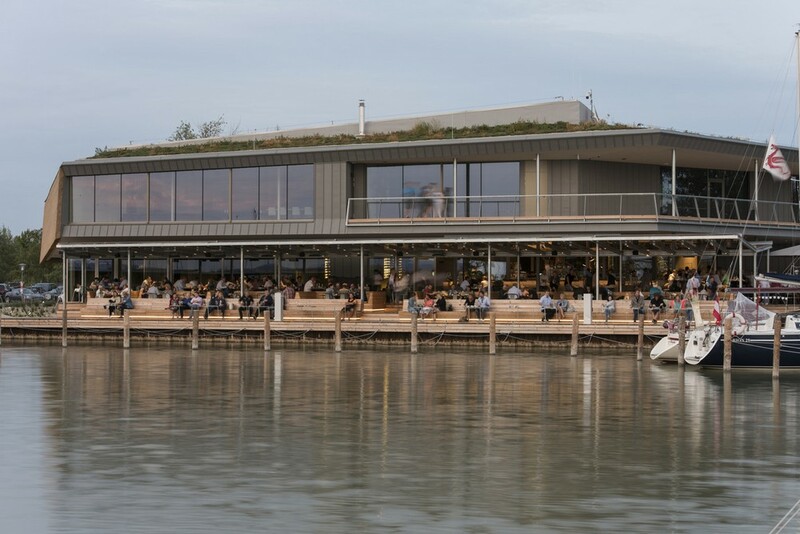 Together with the already existing buildings on the lakeshore area, such as the Mole West in Neusiedl am See, the Seerestaurant Katamaran in Rust, the Seebühne in Mörbisch and many other projects already realized, the new Seerestaurant in Weiden am See will give a new impetus in the Region and enhance the quality of the cultural and landscape area around Lake Neusiedl. 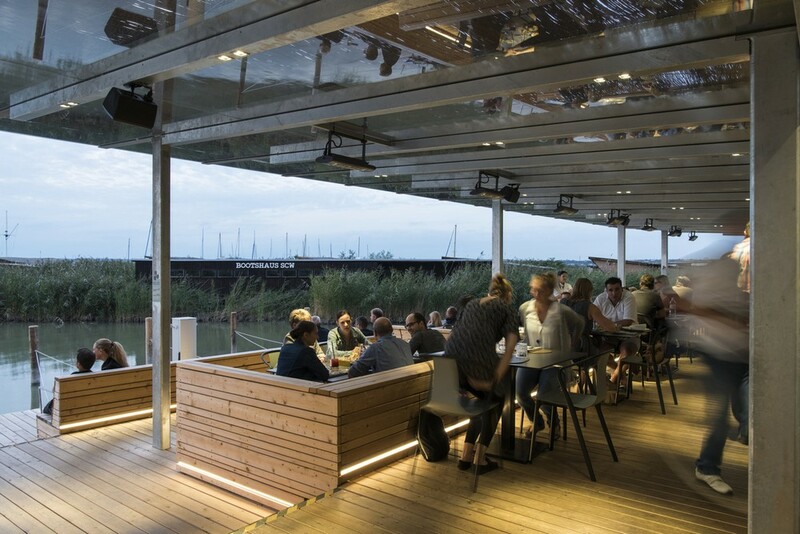 A large wooden pier with varied furnishing and generous planting makes the visitor feel the atmosphere of the Neusiedler See close up. Since the project location is located in the nature reserve, an ecological concept was pursued from the beginning of the design planning, and the landscape and nature were treated with particular sensitivity in order to keep the intervention in the ecosystems to a minimum. 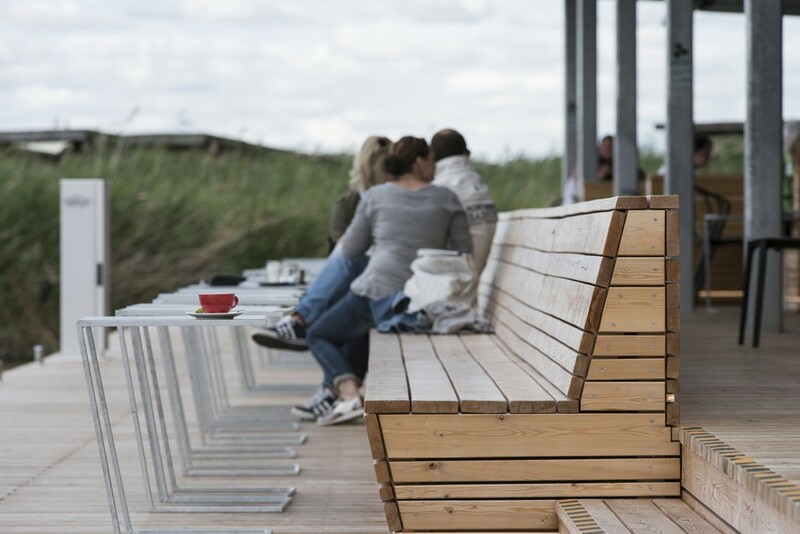 Particular attention has been paid to harmonious integration with the environment, as well as the use of sustainable materials. 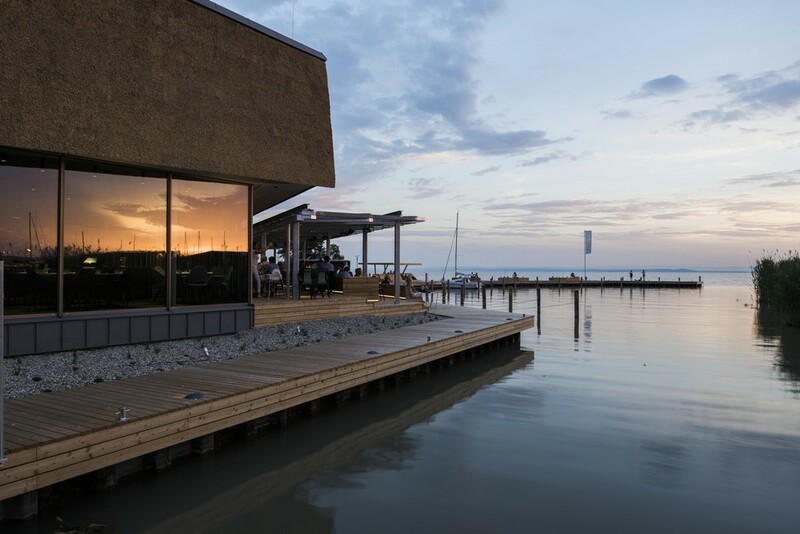 The World Heritage area around the Neusiedler See is a settlement and landscape space for sustainable development, where great emphasis is placed on the symbiosis between building design and nature. World cultural regions have no museum character and are not characterized by as little change as possible, but have the goal of developing the region taking into account historical values. The project property is located directly in a nature reserve, which made it necessary to keep the intervention in the surrounding ecosystem to a minimum during planning and implementation. 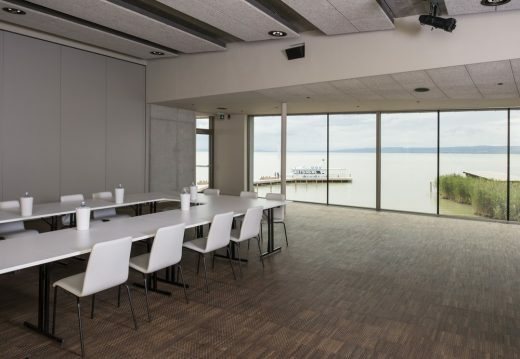 Another challenge was to combine the building and its usable space with the surrounding area in such a way that the visitor enters into a dialogue with the surrounding nature, especially with the shores of Lake Neusiedl, and not only makes the beauty of the surroundings visible but also noticeable becomes. The aim of the project was to create a year-round gastronomy as well as a year-round event area. Apart from setting up a new culinary highlight, the region should also be strengthened by creating new jobs and supporting local partners and suppliers. In addition, an increase in the number of overnight stays in the Neusiedlersee region was sought. Together with the already existing buildings on the lakeshore area, such as the Mole West in Neusiedl am See, the Seerestaurant Katamaran in Rust, the Seebühne in Mörbisch and many other projects already realized, the new Lake-restaurant in Weiden am See will give a new impetus in the region and enhance the quality of the culture and landscape around Lake Neusiedl. 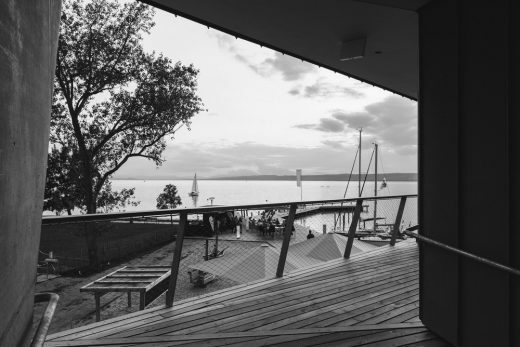 Already at the beginning of the design planning, an ecological idea was pursued and the landscape and nature handled with particular sensitivity. Attention was also paid to harmonious integration with the environment, as well as the use of sustainable materials. 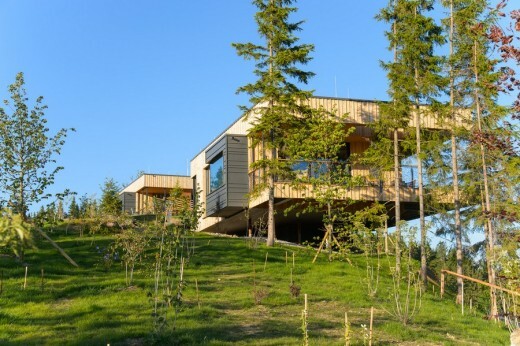 Thus, the two-storey building blends harmoniously into the surrounding landscape and takes due to its building structure and height development consideration for the protected environment. 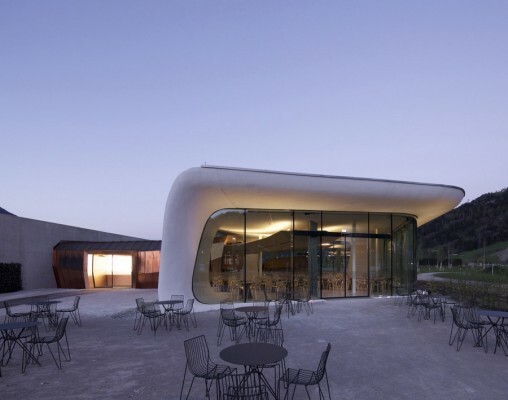 Due to the structure of the building in a main building and an area with auxiliary functions, the visible facade length is reduced and thus adapts optically well into the small-scale settlement structure. With regard to the choice of materials, the regionally prevailing building materials are used in particular. 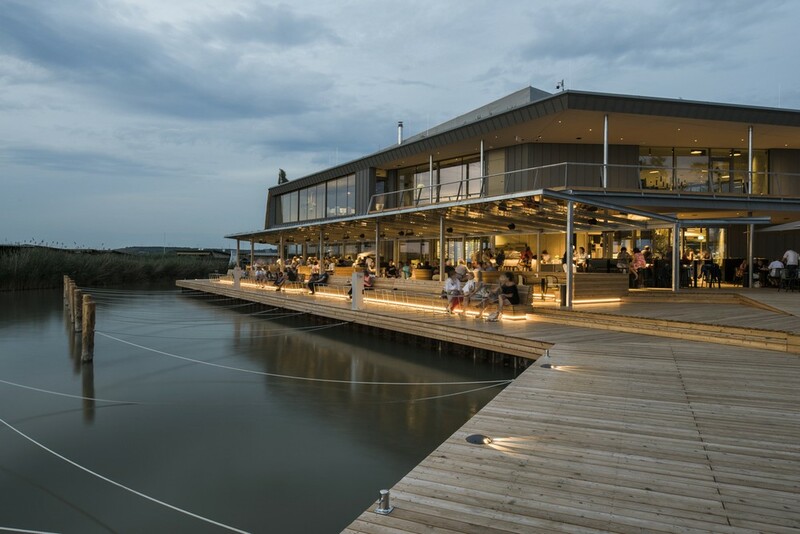 A roof with extensive greenery and the reed facade make the building harmonious with the surrounding landscape. 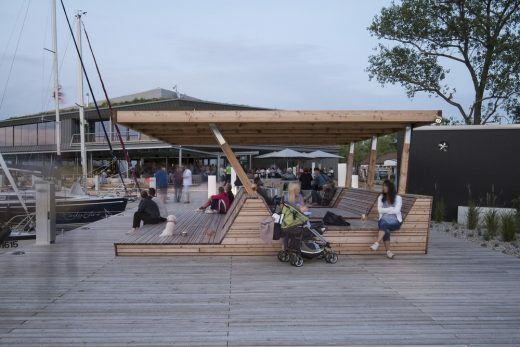 In order to make the connection of building and nature also noticeable for the guests, a large wooden pier was set up with varied furnishing and generous planting. These measures mean that visitors can experience the atmosphere of Lake Neusiedl up close. From the publicly accessible observation deck upstairs, the beauty of the region can be viewed and the expanse of the plain perceived. 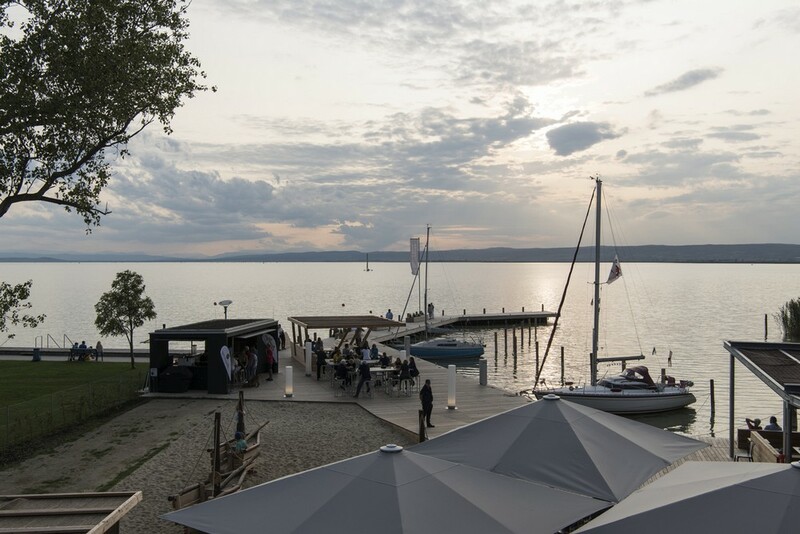 In total, 35 boat berths are available to guests in the marina. These can be used for a relaxed arrival or departure by sea and for a trip to the water and to the surrounding localities.